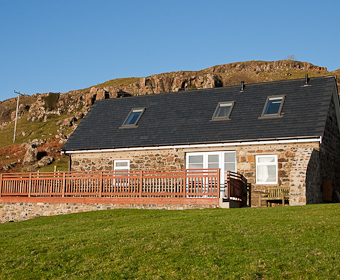 The Smithy offers spacious self catering accommodation for those wanting family holidays on the Isle of Mull, and offers easy and comfortable living space for up to 6 people, with a 40 foot long kitchen/sitting room. The Studio offers self catering accommodation for 2 people wanting short breaks (1 -5 nights) in a light and airy cosy living area with spectacular panoramic views. 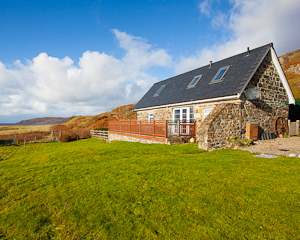 Located on the north western side of the Island both The Smithy, The Bothy and The Studio enjoy panoramic and uninterrupted south west views over Loch Tuath to the Isles of Ulva and Gometra. They take in Ben More to the east and to the west the Treshnish Islands, with the Isle of Coll and Tiree beyond for glorious sunsets. Set on the shore side of the quiet single track road it is just a short walk through a field to a sheltered bay safe for swimming, or behind for hill walking. 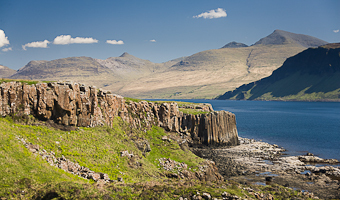 Mull has a range of attractions from the sparkling white sands at Calgary, to the colourful 'capital' of Tobermory with its museum, distillery and chocolate factory as well as numerous shops and restaurants. There are Castles and museums to visit, or fish the sea, rivers or lochs; climb Ben More, or play golf either at Tobermory or Craignure. Explore the hills, find old settlements, pony trek, sail, bird watch, enjoy a picnic or simply collect shells from one of the numerous beaches. The Isle of Mull is a wildlife mecca. It is home to over 250 species of birds including the golden eagle and the rare white tailed sea eagle. Guided Tours, Wildlife Expeditions and cruises are available nearby. Ulva Ferry is a couple of miles away for regular boat trips to the surrounding islands of Treshnish and Staffa. Iona, the ancient centre of Scottish Christianity, Staffa with its basalt columns and Fingals Cave, and the Treshnish Islands where puffins and many other sea birds can be seen. Wildlife cruises are available to watch whales, dolphins, porpoises, basking sharks and other marine mammals. After exploring the island during the day enjoy relaxing beside the open fire in The Smithy or maybe on a beautiful summers evening sit outside on the garden bench and watch the sun set and the sea and sky changing moods. It is a perfect place for a relaxing break away from it all. Artist and photographers are inspired by the glorious colours and ever changing light. Whatever the weather there is always something to do on this beautiful island.